Resembling a miniature orange, kumquats are a popular treat during the Chinese New Year season, as they are a symbol of prosperity for the coming year. Use a knife to cut a slit at both ends of the kumquats or stab the kumquats several times with a (sterilized) needle. In a medium saucepan, add the sugar to the boiling water at medium-high heat, stirring. Turn the heat down to low, cover and simmer for 10 to 15 minutes until the sugar has dissolved. Add the fruit. Simmer, uncovered, for about 30 minutes until the kumquats are tender. Adjust the heat up or down as needed to keep the liquid at a simmer. The total cooking time should be about 45 minutes. 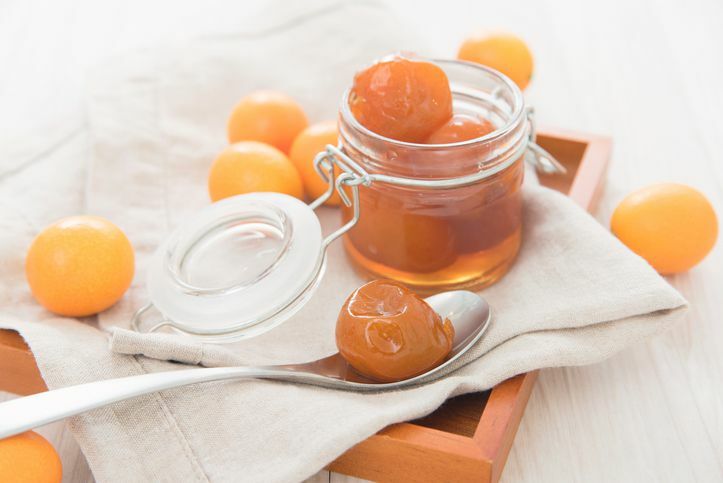 Place the kumquats in sealed jars and refrigerate.